I’ve been camping with my kids ever since they were babies. Even though we live in the mountains surrounded by nature, I love to explore the epic grandeur Mother Nature has to offer and prefer sleeping under the stars to the confinement of a tent. I’ve never it found it challenging to take children camping, and it has always been a good time. Having proper gear, included child size backpacks, sleeping bags, etc, is important, as well as proper clothing. Preparing for bugs and sun are also important to successful outdoor adventures. 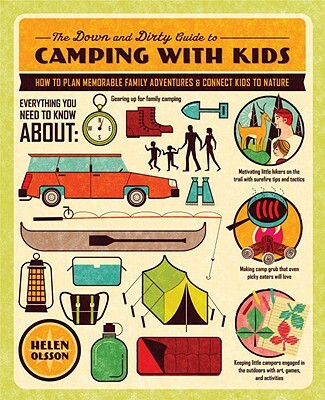 The Down and Dirty Guide to Camping with Kids: How to Plan Memorable Family Adventures and Connect Kids to Nature by Helen Olsson is a great guide for those less familiar with outdoor adventuring. Whether you’re a first-time camper or a veteran backpacker befuddled by the challenges of carting a brood—and all the requisite gear—into the great outdoors, here you’ll find all the tips and tools you need to plan the perfect nature adventure with your family. Humorous and irreverent, yet always authoritative, this guide to camping with kids, from babies through pre-teens, is filled with checklists, smart tips, recipes, games, activities, and art projects. Helen Olsson, a seasoned camper and mother of three, shares lessons learned over the years of nature outings with her own family. Learn the basics of family camping, from choosing a destination and packing gear to setting up a campsite and keeping little ones safe. Create the perfect camp menu with simple and tasty recipe ideas. Discover foolproof tips and tactics for keeping kids happy and entertained while hiking. Explore nature through clever and creative camp arts and craft projects. This guide is your game plan to unplugging from the digital world and connecting your kids to nature. Whether it’s roasting marshmallows around a crackling campfire or stretching out on a camp mat to gaze at the stars, the memories you’ll be making will last a lifetime. If I followed this book, I would feel overplanned. There are great ideas, but I also like to allow my children time to be and let their own imaginations take over in the wilderness. Last year, my daughter made a series of boats out of sticks and leaves. It was an all day activity trying out different configurations and then letting them float away on the lake. It was entirely her idea. Had it been mine, it probably would have lasted 15 minutes. She did say that she would like to take watercolor paint with her next time. I do like the advice in this book, as it does follow proper wilderness etiquette like packing out your used toilet paper. This book is an incredible resource for families just beginning their outdoor adventuring. A trip camping is way cheaper, healthier, and memorable than a trip to Disneyland. I remember more details from my childhood camping trips than those to amusement parks. All families should go camping!